The rooms Bed & Breakfast offers individually furnished rooms, air-conditioning, free Wi-Fi access, and free parking in a quiet location near the Alte Donau recreation area. The Stadtnest B&B is located in a residential area a 5-minute walk from the Mariahilfer Straße shopping street and the Zieglergasse Underground Station (line U3). Free WiFi is available. Vienna-apartment-one Schmidgasse enjoys a central location, just a 3-minute walk from the City Hall. It offers fully equipped apartments with free Wi-Fi. The Singerstrasse 21/25 Apartments enjoy a quiet location in the centre, just 300 metres from the Stephansplatz Underground Station and Saint Stephen’s Cathedral. Each of the spacious apartments is air-conditioned and offers free WiFi access. The modern and bright apartments feature a kitchen, a dining area, a living room with satellite TV, and a bathroom. They are cleaned every third day. 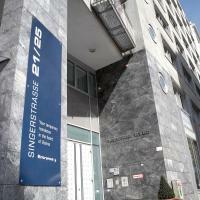 Guests of Apartments Singerstrasse 21/25 can use a washing machine and dryer at an additional cost. A private parking garage can also be used at an additional cost. A supermarket is just across the street, and a fitness centre is a 1-minute walk away. The State Opera and the Hofburg Palace can be reached in a 15-minute walk. 01. Innere Stadt is a great choice for travellers interested in food, shopping and culture. Singerstrasse 21/25 Apartments has been welcoming Booking.com guests since 25 Feb 2013.
locations like the Vienna Hofburg or the city Hall (Rathaus). Take A Break Holidays takeabreakholidays, Vienna Accommodation.